Please #shoplocal in Blackpool town centre, even while redevelopment and building work is underway. 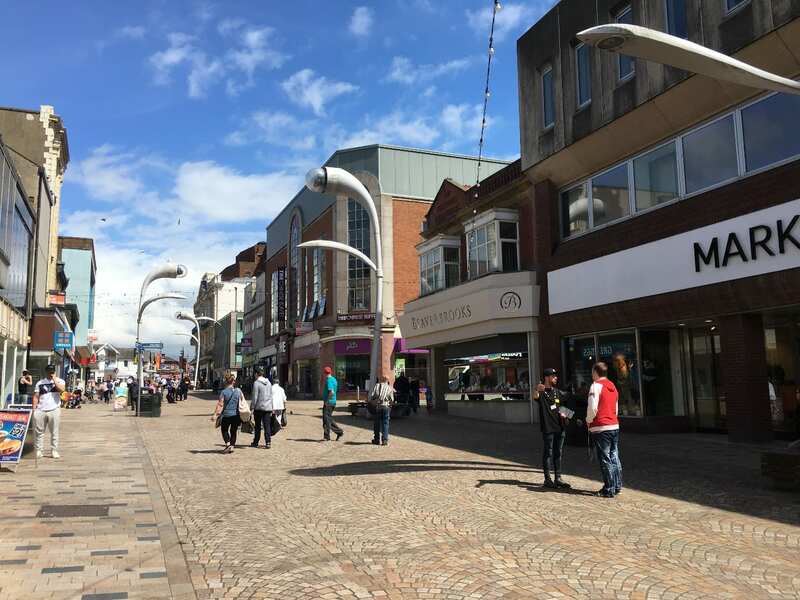 Investment in the town centre is creating better, more attractive places. If you’ve been to Blackpool in recent weeks you’ll know that road works and construction works are going on in various places. Please #shoplocal and support the shops and businesses in Blackpool town centre while this work is happening. Works at Talbot Road to lay tracks for the new tramway extension are progressing. There are lots of improvements taking place. New pavements around Dickson Road as part of the Quality Corridors programme have made a big difference to the street scene. Take a look at the Blackpool BID Facebook page for offers, deals and more from Blackpool town centre shops and businesses. It’s all part of a larger project to create better, more attractive places in Blackpool, leading to investment and jobs for local people. 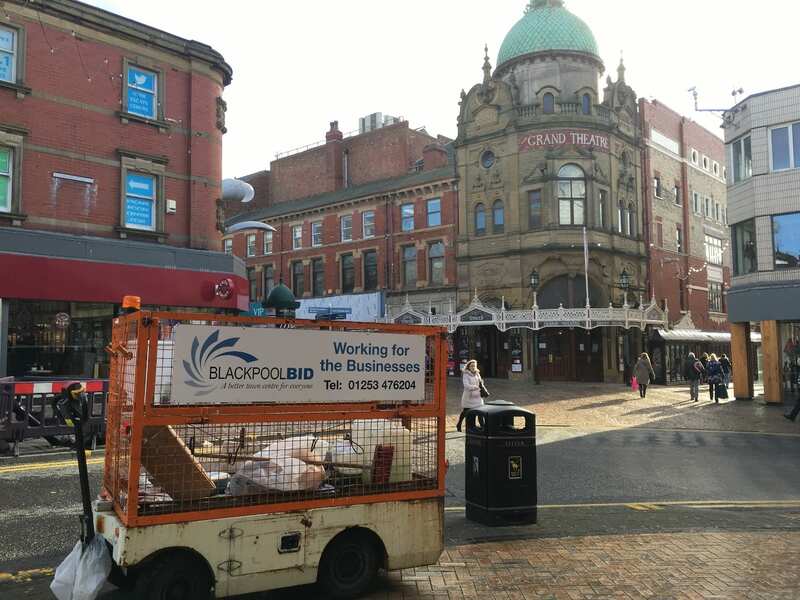 While it’s all going on, the BID continue to work for the businesses in Blackpool, trying to make the town cleaner and safer for everyone. It’s an exciting time in our town, with a lot of investment and planning coming to fruition. You know what they always say on TV – local investment and construction is always a sign that a place is on the up! The Blackpool tramway is being extended to the railway station. The town centre is getting a new conference centre, a new IMAX cinema, and more places to shop and eat. New four and five star hotels are being built. The look and feel of streets will be improved. While all this work is going on, Blackpool BID concentrates on its primary role. 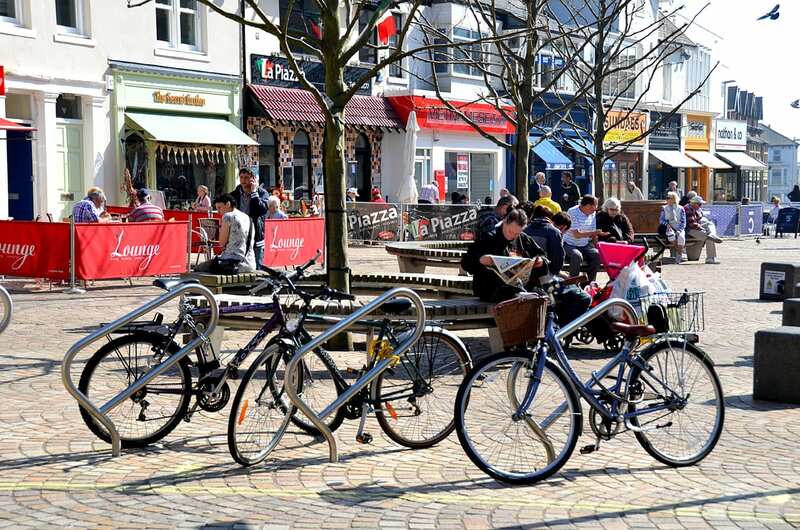 To create a cleaner, safer and inviting town centre with something for everyone, for shopping, entertainment, food and drink. 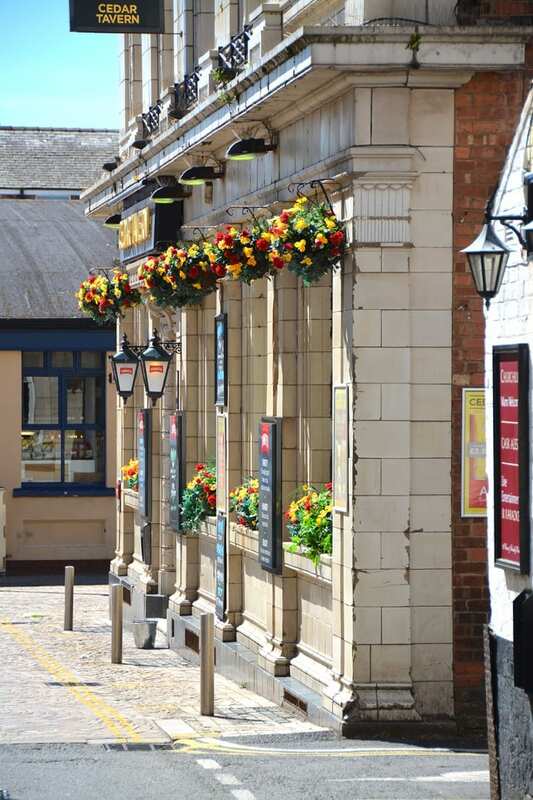 The BID is continuously involved in a multi-agency operation to tackle antisocial behaviour and public nuisance issues in the town centre, mainly caused by beggars, spice users and street drinkers. It’s a problem not just isolated to Blackpool town centre but prevalent in town centres throughout the UK. The operation is ongoing, working with the Police, Trading Standards, Housing Options and the drug and alcohol service. Although legally the process is quite slow the BID are pleased to report that the number of successes is steadily growing. This has lead to a number of Criminal Behaviour Orders being issued, with more cases on the court schedule. The BID recruited 3 additional town centre wardens in September 2017. This enables a full 7 day service to 7.30pm most days. It’s had a significant and positive effect, with praise coming from both retailers and the public alike. Reintroduction of CCTV is invaluable, with some significant crime prevention and arrests since its reinstatement. The BID has agreed to support the continuance of a staffed service to the same level for another 2 years, until November 2019. To help to improve safety and security for the night time economy, the BID will support the continuance of the Safe Haven Bus on Talbot Square. The service was in danger of closure due to a funding shortfall. As it provides a valuable service the BID are happy to support it for the current 12 month period. The BID Board extended the role of the seasonal cleaners to an all year round service. They provide afternoon and evening coverage throughout the winter months. 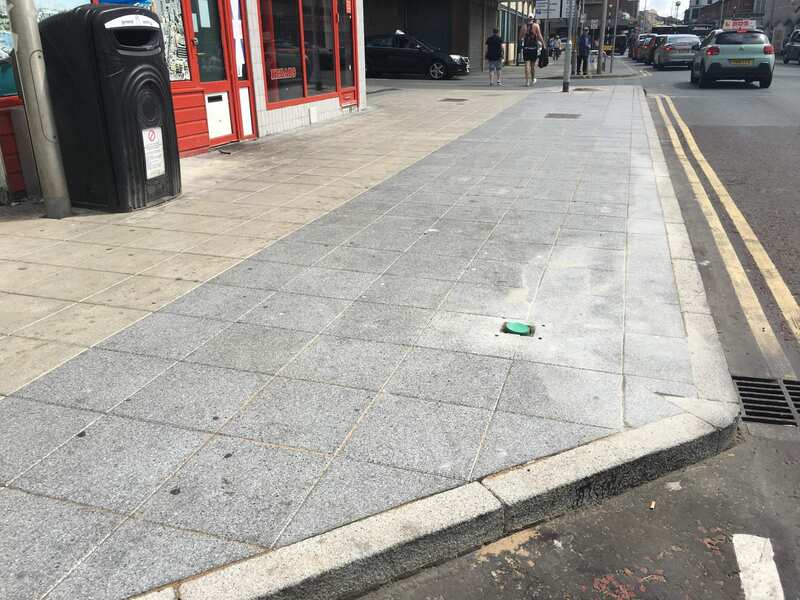 The full time town centre cleaner helps businesses deal with the detritus and rubbish that accumulates around their properties. Positive feedback from businesses and the public alike proves that this cleaning service is invaluable. There’s always something to see and do in Blackpool, whatever the weather! There’s everything here that you’d expect from a great town centre destination. The great thing about Blackpool Town Centre is that it’s got it all. 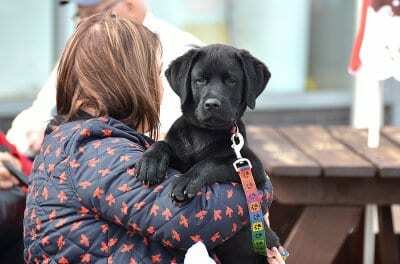 Make it a part of your day out or holiday – a look round the shops, a bite to eat, a walk on the prom, fun and entertainment – all in close proximity and easy walking distance for a great day out for all the family. 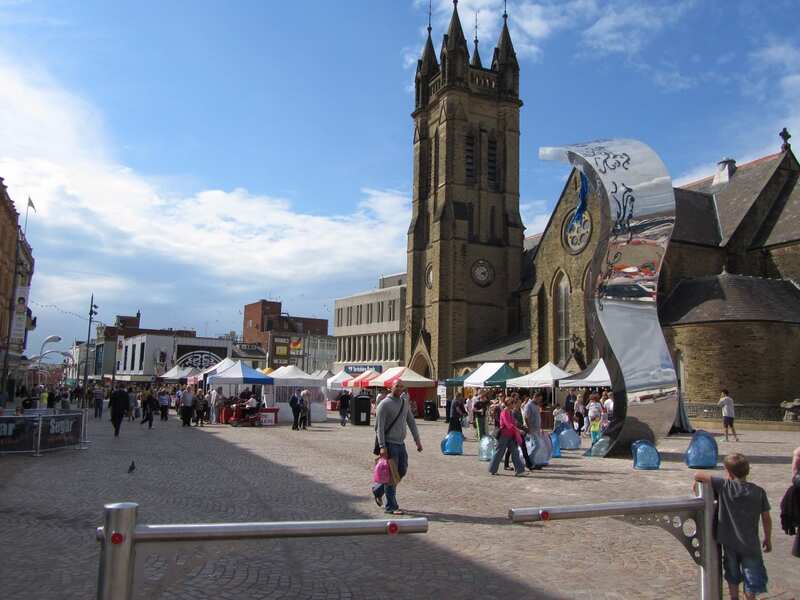 Blackpool Town Centre is managed by Blackpool BID – creating a cleaner, safer and inviting town centre with something for everyone – shopping and markets, entertainment, food and drink. Enjoy the indoor malls of the Houndshill Shopping Centre with national names including Debenhams, Next, New Look and more besides. All under cover in bright and spacious surroundings with cafes, toilets, car parking and baby changing on hand. 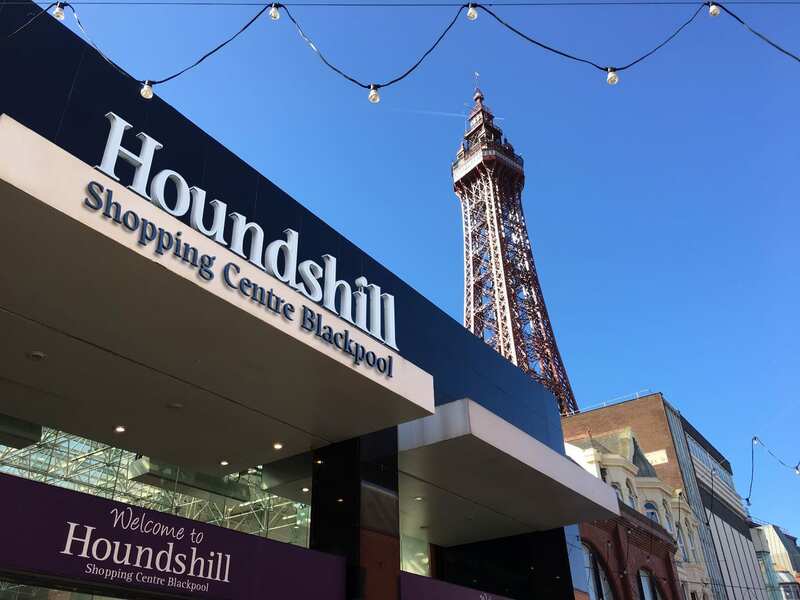 Head outside into the sunshine and sea air of the streets around the Houndshill to find many other big high street names. They include Marks and Spencer, WH Smith, TK Maxx, a spectacular Primark on four floors – and similar national chains. Beyond the very centre of town are plenty of independent retailers to explore, with some really nice products to find. There’s all kinds of women’s, men’s and children’s fashions, but also hairdressers, nail bars, cafes and food shops, solicitors and pet shops. 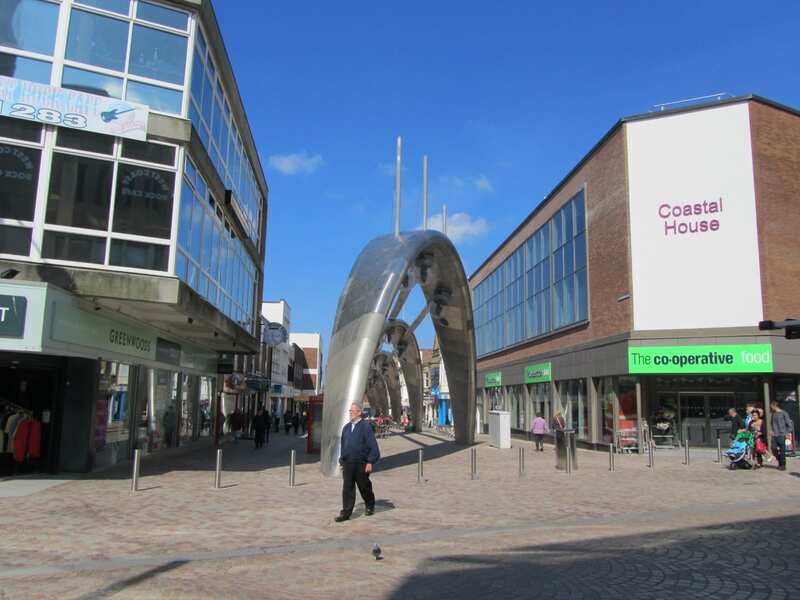 Food retailers include the Co-op – a handy supermarket right in the centre of town on Birley Street. Just across the road from Birley Street is Abingdon Street Market. 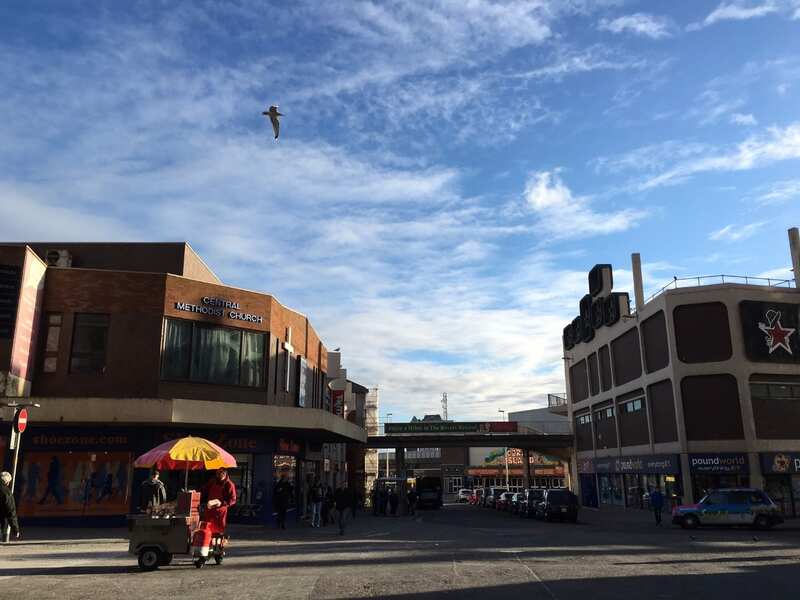 It’s a traditional market and long standing part of Blackpool’s retail landscape. Stalls include fruit and veg, bakeries, cheese and dairy, home cooked meats to make your mouth water, and more. The good thing about Blackpool is that it’s actually quite a compact place, so you’re not too affected by the inclement British weather! Unlike some cities and town centres where you can walk for miles just getting from place to place, here in Blackpool you can spend most of your time and energy actually finding whatever it is you came for. Without getting a drowning from the weather! Blackpool Town Centre is also a great place for leisure too. Perfect if you’re not a great shopper but like the atmosphere of a busy place to spend your free time. There are plenty of restaurants, pavement cafes and bars where you can meet a friend for a drink and a bite to eat. Try the ever popular Nando’s and Pizza Express – or maybe one of the Taste of Lancashire assured independent restaurants. If you prefer a quick bite to eat, you’re spoilt for choice with coffee shops and cafes. 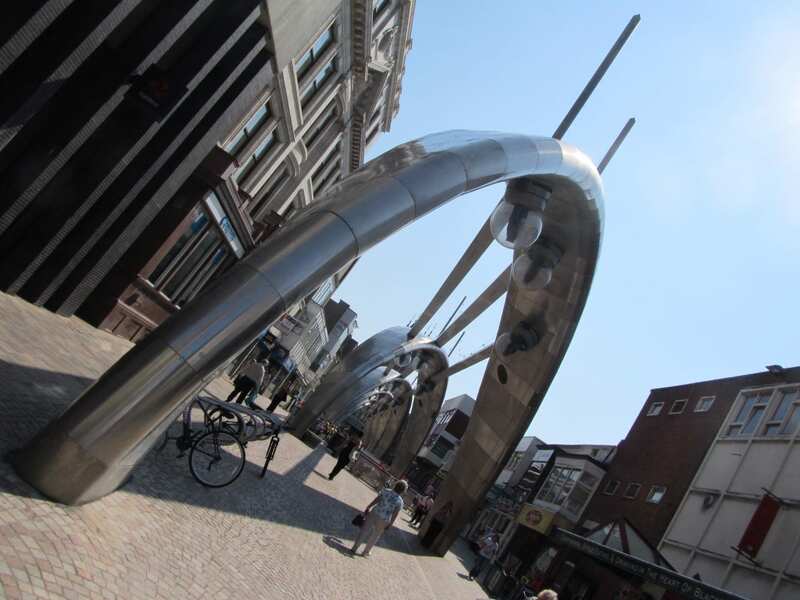 Why not head to Birley Street – a pedestrianised area where you’ll find Brilliance. The huge overhead steel structures play music and light shows and in season link the Illuminations to the town centre. Even in the daytime it’s an experience and somewhere to sit awhile and just take in the sights and sounds. At night it comes to life! 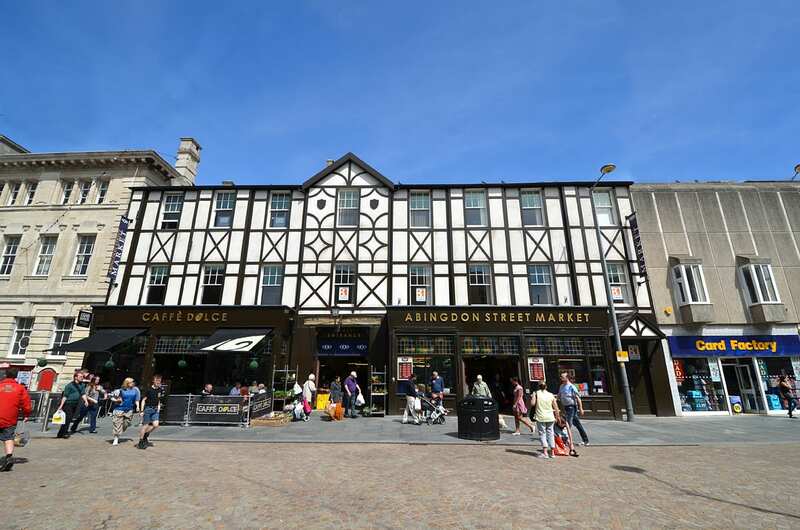 A short stroll from Birley Street, past the mock-tudor front of the market at Abingdon Street, is St John’s Square. It’s a really nice open public space right in the heart of town, and where you’ll often find things happening. St John’s Square is a pedestrianised space so it’s perfectly safe for your little ones to run about. You can sit a while in the sunshine with a coffee and a cake at one of the many cafes. As you pass through St John’s Square, you’ll see the diving sculpture and see how the light catches it at different times of the day and year. 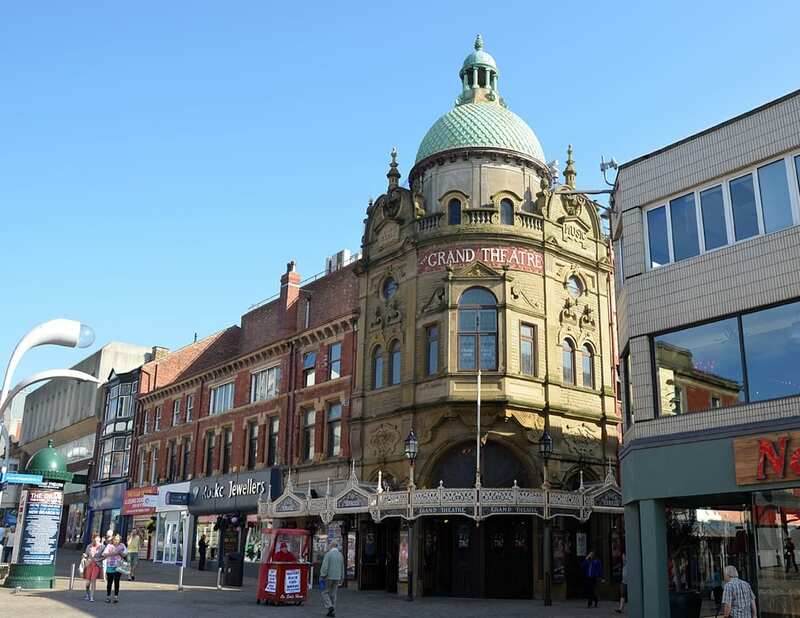 Of course Blackpool Town Centre is also where you’ll find the Winter Gardens, The Grand Theatre and Blackpool Tower. There’s a world of entertainment and leisure to suit everyone, with West End shows, comedy, drama and dazzling nightlife are all here, just waiting to be enjoyed. 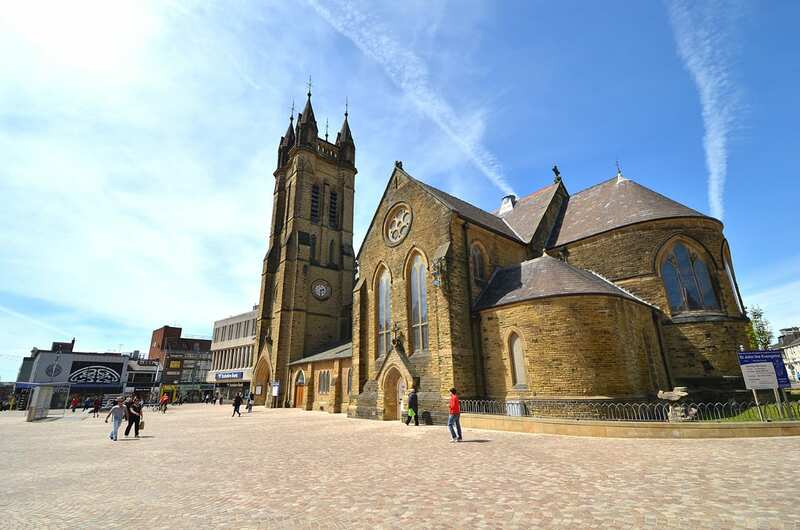 Come and enjoy Blackpool Town Centre – it’s got it all! Blackpool BID looks after the town centre area from the promenade between Central and North Piers to Sainsburys and the railway station going inland. Businesses pay a levy amounting to 1% of their rateable value to pay for BID activities which include events, warden services and security. 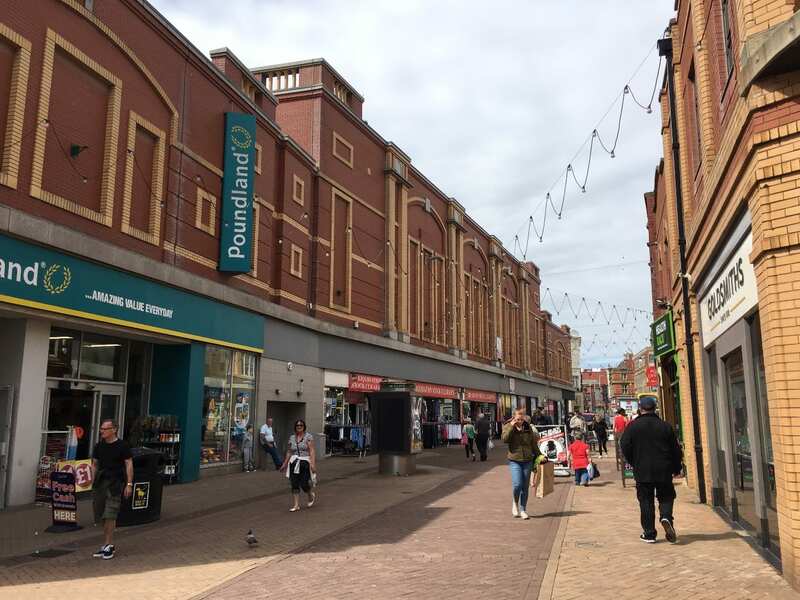 The aim of Blackpool BID is to create a cleaner, safer and inviting town centre with something for everyone – shopping and markets, entertainment, food and drink. 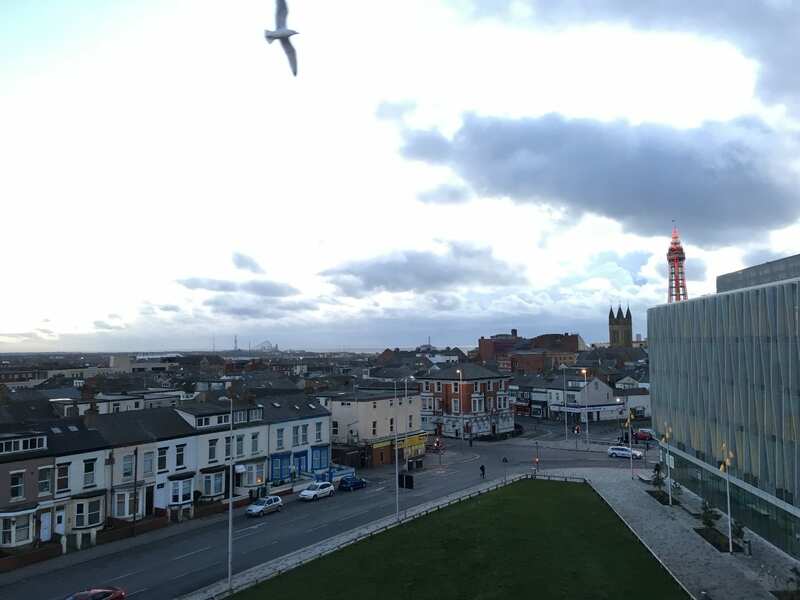 The resort’s Business Improvement District, or Blackpool BID, is just that - a partnership between more than 500 of Blackpool's town centre businesses and organisations working together to improve business, and the environment, for the benefit of all. Take a Tram into the town centre during the Easter holidays, the Blackpool Transport trams run the full length of the seafront, so even if you haven't a destination in mind, it's fun just to see the sights! 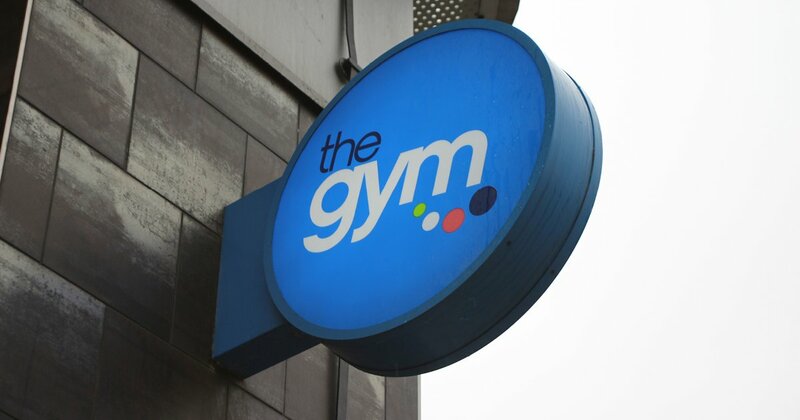 The Gym Group Blackpool on Talbot Road is open 24 hours and offers a huge range of equipment and classes to suit all workouts. So get fit for Summer and join today for as little as £12.99 a month, and what’s better is that it’s just had a refit and new equipment, what are you waiting for, sign up today!